Find out how Merkle RMG can help you improve the speed, accuracy, efficiency, and security of your back-end fundraising operations to help you strategically build stronger relationships with your donors and generate more funds to support the mission of your organization. Aeon provides an integrated sustainer processing and management solution that is flexible and cost-effective. You make it easier for donors to become sustaining supporters, giving them the freedom and flexibility to give whenever and however they want. Recurring gift program managers gain better visibility into program activity and status, using valuable data and insights to retain current sustainers and acquire new ones. Multi-channel sign-ups and updates – Our customizable online portal makes it easy for donors or staff to initiate and update gifts. It automatically imports files from other sources on a designated schedule. It also reviews and validates data as complete and correct, identifying and queuing transactions for repair and recovery as needed. A robust processing engine and database – Your donors control the amount, frequency and method of their recurring donations. 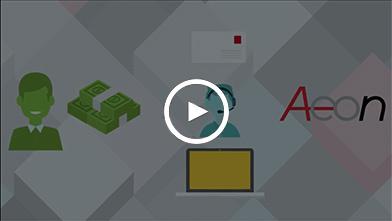 Aeon identifies and resolves issues with payment accounts to help you avoid lapses. It also provides complete visibility to donor history and activity, along with access to dashboard reporting on program metrics. Comprehensive donor acknowledgement and reporting – Our solution manages new gift acknowledgment and updates to giving parameters. It can also send statements to your donors at the frequency you specify. The solution sends transaction files for updating your donor management system, and you can generate and distribute customizable reports for detailed program analysis. Last year 24% of moves within in the US were not reported to the post office. That’s a huge number of donors who are not receiving your appeals. 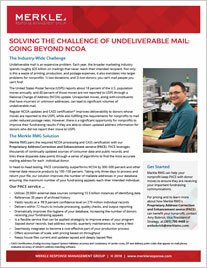 Learn how Merkle RMG can help you solve the challenge of undeliverable mail. Learn about donation processing and payment transactions trends in our first benchmark report. Over 38.8 million transactions and over $1.5 billion in donations were analyzed! Merkle RMG commissioned this study to learn more about how nonprofits manage their direct mail responses, how well they are performing, the importance of specific attributes when evaluating outsourcing options and their perception of the benefits of outsourcing. The chances that an event will occur that disrupts the processing of your direct mail responses are small but the impact can be devastating. 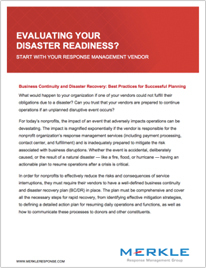 Learn about the importance of having a well-defined Disaster Recovery/Business Continuity Plan and what it should cover. Merkle Response Management Group is a wholly-owned subsidiary of Merkle, Inc.